In a Sherlock Holmes story Arthur Conan Doyle makes much of a dog that failed to bark when its owner’s house was trespassed on. 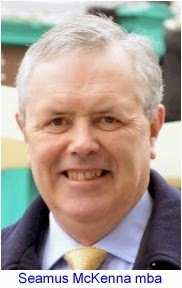 Now, U.S. payroll data is very carefully watched by traders because the Federal Reserve has made it known that the level of employment will be the major factor in its decisions about the tapering of Quantitative Easing (QE) which will, in turn, have a significant impact on the value of the U.S. dollar against other global currencies. Automatic Data Processing (ADP) Inc, a private company which processes payroll data on an outsourced basis for a great many employers in the USA has, for some time now, been using its own databases to compile a payroll count that is designed to anticipate, by at least one day, the findings of the official U.S. Non-Farm Payroll report, which is produced by the Bureau of Labor Statistics. 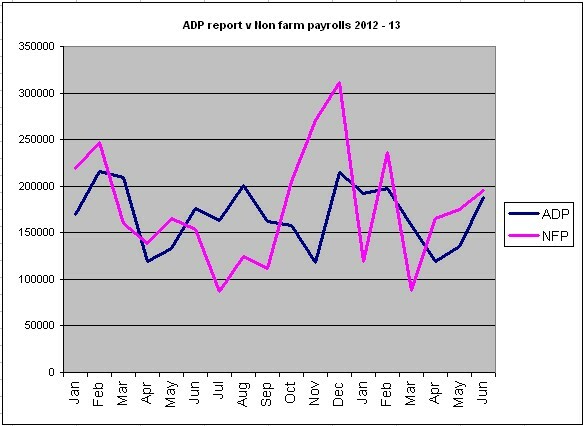 The ADP report has come to be as much is not more closely watched than the NFP report each month. And this is deserved. At top is the comparison chart for the results of both surveys in 2012 and the first half of 2013. They are correlated, but not very well in terms of absolute figures. The coefficient of correlation, which measures the value of the first one out (ADP) as a predictor of the second (NFP) is 0.232699 over the period studied. Zero would mean they were not correlated at all, while a result of 1 would mean perfect correlation. But if ADP is far from perfect in absolute terms, it is a good predictor of the direction of payroll numbers month-on-month. In 13 out of the 17 months studied, in other words for 76.47% of the time, the ADP outcome was in the same direction, either up or down month-on-month, as the NFP result. This is important, because growth or decline is probably equally if not more significant than the degree to which payroll numbers are changing. So ADP normally gives the cue to traders as to whether or not they should sell or buy U.S. dollars. For example, here is the situation in February of 2013 (reports cover January of 2013). 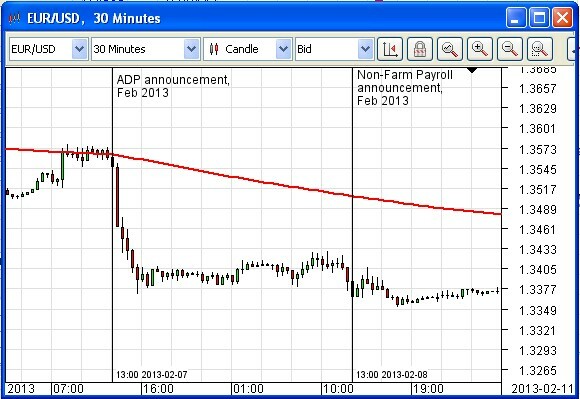 In this case, the serious movement in the EURUSD rate took place when the ADP report hit the wires, and NFP was something of an anti-climax. This is typical. 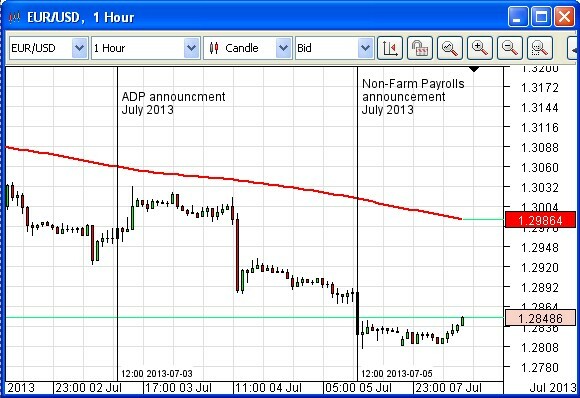 Here ADP caused barely a stir when released, although there was a seemingly delayed reaction 24 hours later, at the normal open of the U.S. markets the following day. This in itself is strange, as that happened to be the 4th of July, Independence Day, and a national holiday in the U.S.
Then, when the NFP report came out on Friday the 5th , the pair dropped again. This was to be expected in the light of the ADP report, as on this occasion it did not disappoint as a predictor. The mystery remains, however. Why was there such a time lag on the part of the larger traders, the ones who are in a position to move the market, in taking advantage of the knowledge gained from the ADP report on this occasion? Our own positions, where we are short gold and the Aussie dollar against the U.S. Dollar and which are managed by the Omicron Forex Silver Trigger automated routine, maintained their profitable growth rates after both reports.